An approximate stretch of 200-foot of the Dhussi bundh at Garhi Fazal village was washed away in the wee hours today thereby spreading the fear of flood in almost 15 villages. It may sound strange, but the district administration and residents of Mattewara village have brazenly ruined the ecology to save 13 villages from floods by resorting to the age-old method of plugging the breach. With barely two days left in commencement of the mega event, confusion prevails over the auction of a common land at Chhapar village for the purpose of establishing stalls and vends during the historic mela. Residents beware, an organised gang of robbers is on the prowl. They enter the house on the pretext of giving an invitation for marriage and then rob occupants, mostly women, of their jewellery. In a latest incident, a youth entered the house of an elderly woman in Krishna Nagar near Ghumar Mandi and fled away with a gold ring, four bangles and pair of earrings worth `1. 50 lakh here today. A 25-year-old bank employee sustained injuries after she reportedly lost control over the scooter she was driving due to the potholes at Dholewal road today. The victim identified as Jyoti was working in an overseas branch of the State Bank of India near Dholewal. She lay injured on the road for nearly half-an-hour. This incident took place at around 10.45 am. With the construction work of a flyover over the Lakkar Bridge going at a snail’s pace, snarl-ups have become a routine affair in the Bhadaur House area, causing lots of inconvenience to commuters as well as shopkeepers. There is only a narrow stretch left for the vehicles to pass and it has become a major traffic bottleneck. Things are getting worse in the absence of traffic cops and verbal duels have become a routine affair. 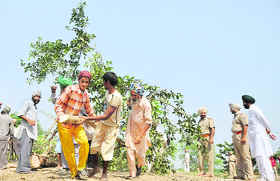 Barely three days after the nursing student ended his life by jumping from a mobile tower at Fatehgarh Jattan village near Macchiwara, a girl, who was also studying at the Desh Bhagat Institute in Gobindgarh, committed suicide by hanging herself from a ceiling fan in her house at Kot Mangal Singh here today. The police is feeling sandwiched between demands for taking strict action against perpetrators of the recent attack on St Thomas Church at Malerkotla and allegations of unnecessarily harassing members of a particular community. Any step taken by the police for rounding up or calling someone to the police station for questioning is followed by hue and cry among politicians. Former Chief Minister Capt Amarinder Singh today said the scam involving lakhs of rupees in the Indira Awas Yojna in the Ludhiana Additional Deputy Commissioner’s office might be just a tip of an iceberg and the money involved might be more. 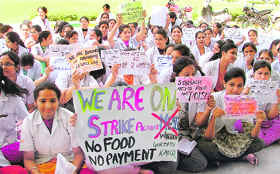 Baba Jaswant Singh Dental College authorities and students are once again at loggerheads. This time, the issue is about hostel mess food. Nine-year-old Barinder Singh was given a new lease of life at Dayanand Medical College and Hospital (DMCH) where he was successfully operated upon for chronic kidney failure with end stage renal disease. Barinder recently underwent a successful renal transplant by eminent urologist, Dr Baldev Singh Aulakh, professor of urology and head of transplant unit at DMCH. The mother donated the kidney to the child. The death of an NRI woman still remains a mystery, as a team of England police is groping in the dark at Khanna and adjoining areas to find the truth behind her death. The team, with the assistance of the Khanna police, is conducting an enquiry in various banks like ICICI, IDBI and Indusland Bank. The team also visited her in-laws at Bija village and some other villages to conduct the probe. The agitating power loom workers of Gaushala, Madhopuri, Kashmir Nagar, and Horgobind Pura submitted a memorandum to the Labour Commissioner at the Gill road here yesterday. The wokers were protesting against the low wages and non-implementation of the labour laws in their units. A few weeks ago, the power loom workers of Shakti Nagar had also staged a protest due to similar reasons. Their owners had complied with their demands and now the workers of other units were also following their footsteps to get their rights. Strong economic growth, young population, better industrial and business environment, stable political structure, optimistic environment are the key factors that provide better investment opportunities in India, said Ajay Bagga, managing director and head of private wealth management at Deutsche Bank, India. The department of neurology at Dayanand Medical College and Hospital (DMCH) has launched a helpline to provide timely assistance to stroke victims. Patients from the region can avail this facility by calling at helpline No-099153-55100 in case of brain stroke. 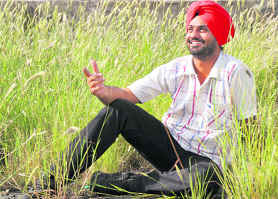 Schoolteacher Karamjeet Singh Grewal’s Punjabi song has been selected for Bharat Scouts and Guides. It is an international scout movement. “It is a proud moment for me. My song - Jo sach da rah dikhaundi hai oh guiding hai - is one of the eight songs, which has been selected for scout movement,” says an elated Grewal, who is a Punjabi teacher at Government High School, Kheri Jhameri. Dr Sandeep Singh Sidhu, professor of gastroenterology at Dayanand Medical College and Hospital (DMCH), recently visited Addenbrookes Hospital, University of Cambridge, United Kingdom, which according to him is a world acclaimed centre for liver transplantation and multivisceral (liver and kidney; pancreas, kidney and intestine) transplantation. Punjab College of Technical Education Institute of Hotel Management organised its bi-annual food festival “Daawat-e-Khas” here today. 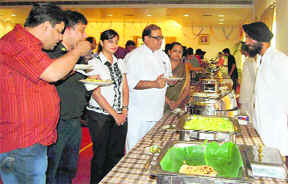 Dishes, including Awadhi, Punjabi, Rajasthani and Kashmiri cuisine were prepared and displayed. Star dishes of the event were dal Peshawri, jangli maas, murg sahib Patiala and paneer Jehangiri. In the wake of rising number of highway robberies, the police today conducted a special meeting with the bank authorities and petrol pump owners of Mullapur. SHO Mullapur Jungjit Singh told all bank officials to depute a night watchman at their respective banks. Manmohan Singh, a famous Punjabi director, who has given seven hits in the past seven years, is once again donned the cap of director with his romantic drama “Ik Kudi Punjab Di”. The film was premiered at PVR here on Thursday. Radcliffe School, BRS Nagar, in association with Dr Muktinder Singh, MD (homoeopathy), and director, HomoeoCARE, organised a health check-up camp on its premises here. Mandi Gobindgarh, September 18 Jawahar Lal Nehru Government Girls College, Tooran (Mandi Gobindgarh) celebrated “Vanamahotsava” today. Activists of the District Youth Congress today staged a dharna to protest against the arrest of the Punjab Youth Congress (PYC) president, Ravneet Singh Bittu, who were arrested yesterday by the police. Residents were shaken out of their sleep after an earthquake of 6.3 on the Richter scale rocked the city and entire North India last midnight. In yet another broad daylight snatching incident, two motorcycle-borne youths snatched a gold chain, worth Rs 50,000, of a woman near Sector- 32- A here today. Two children were crushed to death whereas three persons were reported to have sustained serious injuries after an over-speeding truck run over them near the Phillaur toll plaza here yesterday. The incident took place at around 6.15 pm, when the victim, all residents of the Field Gunj area, were on their way to the Sutlej for immersing the idol of Lord Ganesh. The Dehlon police has begun a probe into alleged reports of the nexus between a gang of swindlers using fake mobile phone connections and agents of authorised dealers of various telecom companies. The court of Sessions Judge SP Bangarh today adjourned the hearing in the alleged multi-crore City Centre scam till October 9. The lawyer of former trustee of Ludhiana Improvement Trust, Kala Navkar Jain, continued her arguments on framing charges against her client on the sixth hearing. She was yet to conclude her arguments.